Accusol is one of the rapidly growing CRM and ERP development companies in India. Educational Institutes like Colleges and Schools are in themselves a vast environment, which requires complex administrative processes to manage them smoothly. The rising enrollments and students in educational institute has spur more staff, resources and increased tasks which need to be managed and dealt diligently in cost-effective manner. This inflicts efforts on the part of administrator to alleviate the entire task of school management on time with cent percent accuracy. But without a suitable School Management Software, it becomes mammoth data entry job that slows down institution’s working and saps its precious resources. School Management Software is software to manage the entire school activities and reinforces improved working of school. It facilitates flawless school administration with customizable reports of each activity to provide paperless and efficient school management system. It helps administrators in fees management, admission process, campus resources, library and canteen management, administrative payroll and alumni management to impart tighter control over all the functions of the college or school. At click of buttons, administrators can access wide range of information on any student. You can know about your academic curriculum and performance, disciplinary actions taken, attendance records and other vital information to ensure student’s compliance with rules and regulations laid down by the Institute. This propel saving of time and money which you invest in more productive and important task. This could include building a stronger goodwill and relationship with stakeholders or enhancing school culture. School Management Software or Education based ERP solution removes outdated manual processes, eliminates paperwork, and provides a common platform where students can interact with administrators to iron out shortcomings or settle issues that otherwise would have consumed large amount of time and efforts. The in-built modules can be easily configured according to the needs of the individual institutes. The system maintains historical records of each and every student right from enrolment to final passing out as well as other activities apart of teaching which helps in taking informed decisions and execute activities in the interest of overall school, its staff and students. School Management Software also caters to financial aspects which helps administrators evaluate school income from fees and donations as well as keeps a watch its expenses and spending that helps to keep the institute financially sound and truthful in the eyes of stakeholders. Besides this the web application feature of School Management System enforces greater parents involvement with 24/7 access to important data and information which conversely infuse better communication and relationship among teachers and parents. Moreover it offers valuable insight on each student’s progress to help in taking better assessment and judgment on student’s curriculum and academic career options. On the whole, School Management Software acts as a boon for any school, college or educational institute that is willing to take a step ahead in achieving higher efficiency with technology frontier for appropriate justice to TCO and best functioning of school attaining maximum ROI. Accusol offer generic ERP solution called EduERP to enhance effective management Educational Institutes. 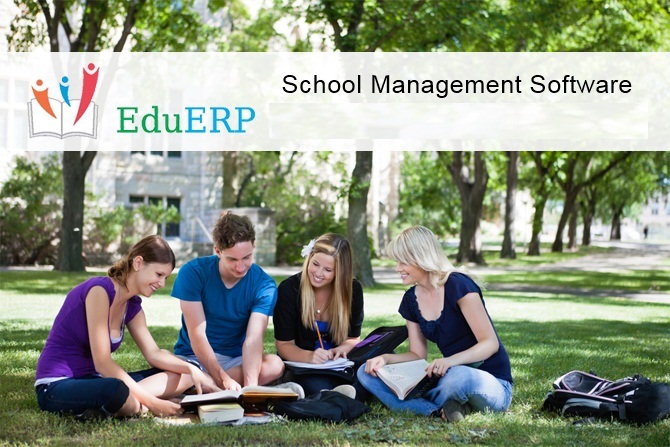 EduERP is Web-based system which comes with different modules such as admission management, fees management, library and canteen management, attendance and examination management, transportation management, alumni management, etc to synthesize complete school workflow and result in efficient school management. Categories: Institute Management Software, School ERP | Tags: Institute Management Software, School ERP, School Management Software, Student Management Software | Permalink.